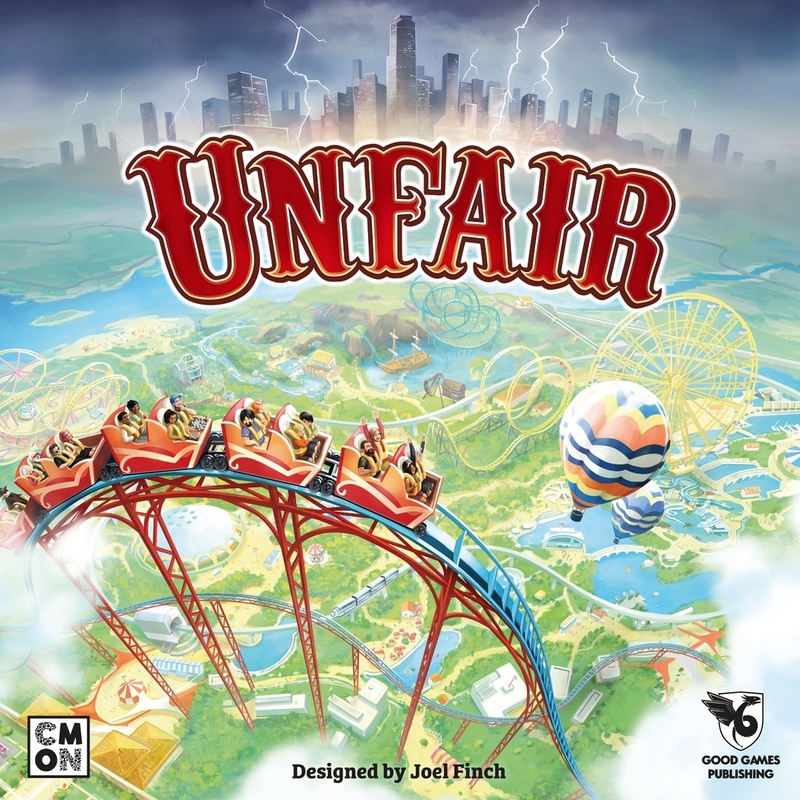 Unfair is a card drafting and tableau building game where the goal is to build the “best” amusement park possible. Before the game starts each player chooses a theme deck to be included for that game. Each round starts with the players drawing an event card and then an event card being revealed from the city. The city’s event cards serve as a round counter, but are also split into two halves. The first half of the city event deck are “Funfair” cards where the consequences are never negative, but the second half of the deck is composed of “Unfair” cards and they are pretty much guaranteed to ruin your plans for that round. After the city event has been resolved the players have the chance to play their own events. Each event card has a “nice” option and a “mean” option. The “nice” option typically gives an advantage to the player who played it while the “mean” option hurts another player in some fashion. The meat of over round comes in the 3, possibly 4, actions that each player takes. Each action allows them to pay for a card from their hand or the face-up cards in the market and place it into their tableau (the space directly in front of them). There are a variety of types of cards that a player may add to their amusement park; attractions, upgrades, staff members, resources and showcase cards. Each type of card has different requisites in order to include them into your tableau including a cost and possibly the need for it to be installed onto a specific type of attraction. Each card can add stars (which determine how many customers came to your park), abilities and icons to each attraction (which determine the points at the end of the game). The other options for each action are to take a card from the market into their hand, draw two cards from the event, blueprint or park cards and keep one discard a card to draw five from any of those decks and keep one, demolish/dismiss a card from your park or collect loose change (one coin per installed attraction). At the end of the round each player sees how many customers came to their park (based on the installed attractions, staff and upgrades). At the end of the game, players look at each of the cards in their park and blueprint cards to determine their total score. Some cards give you points by themselves and the blueprints give you points based on achieving certain combinations within your park. The largest potential points comes from the total number of icons on each attraction. Each card has one or two icons and each icon adds between 3 and 26 points to your total depending on how many you have. Unfair is a solid game and it handles the theme pretty well. If asked to play, I wouldn’t turn it down. One of my favorite things about the game are the Game Changers. The Game Changers are a set of cards that you can choose to include or not which add additional rules for that game. I love the variety this gives and how you can change the game based on the group that you have. For instance, if you are playing with a group that does not like to attack each other, then you can add in the World Peace Game Changer and now they cannot play any event card for the “mean” option. It is a simple addition to the game, but I absolutely love them and wish other games came with the same type of cards. While the game doesn’t give me a true feeling for creating an amusement park (I mean, have you ever seen a Robot Vampire Ninja themed Restaurant? ), it was kind of fun creating said Restaurant that also has luxury seating, coat check and air conditioning. One of my major complaints of the game are the three actions per round. I wish there were a standard 4 actions with a possible fifth one, because I never felt like we had the chance to really build a complete park. Another issue I had, was that it is sometimes hard to find what you need in order to complete the blueprints. One of the games I played, I searched all game for a Restaurant and only had one in my hand once. Before having a chance to build it, I was forced to discard it through an Unfair card. It was disappointing to say the least. Unfair is not a difficult game at all, but there are a couple of things that can cause some issues with certain players. The scoring with icons can cause some issues, but not too much as you can simply say, the more the better. The bigger issue comes with counting the stars for the number of customers, but not being able to have more than the capacity. It isn’t a huge issue, but it may take the scoring of the round to completely understand. Overall, though, Unfair is a pretty straight forward game. Great review. I feel like this very good game hasn’t gotten the attention it deserves because of a weirdly negative Tom Vasel review where he disliked how “mean” the game could be. I feel like it’s as mean as the players make it, and my family loves playing it together. We don’t play mean, we play nice! We love each other! We’re a family!